Before mobile phones become popular, people used to read newspapers or watch television to know what’s happening in their city, country or the world. Smart folks used computers to surf news websites. IOS and Android OS powered mobile devices are no less than desktop computers. Hence, it’s now possible to get news on any topic from any part of the world on our phones. The Android operating system is developed and maintained by Google whereas Apple owns the IOS OS. Both companies have launched an App Store where you’ll find tons of news apps. The news applications read RSS aka web feed of websites and present the news in a beautiful interface. To do so, they use the internet connection on the phone. Below, we’ve covered the best apps among the plethora of news apps available on iTunes and Google Play Store. The apps will bring the latest news to your phone in real time. When there’s a breaking story, simply refresh the UI and the app will show its magic. FB is a free magazine app which is being used daily by 10000+ users. To get latest updates on your mobile device with Flipboard, you must first choose the topics of your interest. Then, you must select the websites you’d like to follow. 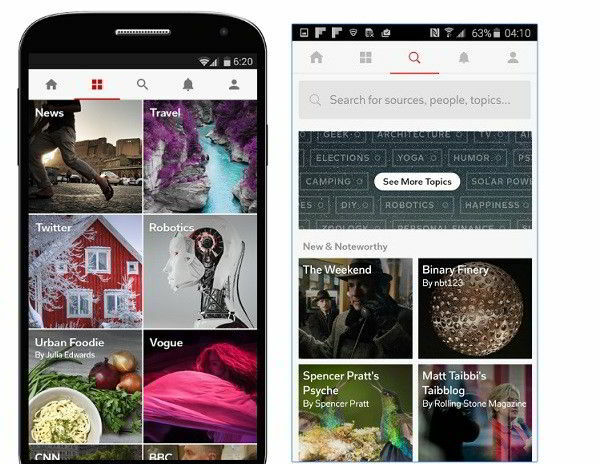 Flipboard will create a beautiful magazine from the publications/topics you’ve followed. You can create as many personalized magazines as you want with this application. Flipboard has a search option through which you can find news on any person or place. It provides an option to save stores as a bookmark. Hence, you can go through your favorite stories later. Publications in Flipboard are added after a Flipboard employee personally reviews the websites. Hence, you’ll find only top-notch news portals in this app. This application allows you to go through local news in 20+ countries. It offers a widget utility. FB is one of the top news reader apps for mobile devices. Sometimes, the editor or the publisher adds personal opinions to the news to make it look more compelling. If you hate reading personal opinions, then InShorts is for you. This application will present news stories in just 60 words. It makes you aware of the latest and most interesting politics, business, startup, tech, sports stories from India and in the world. Like Flipboard, InShorts delivers news to your phone only from top publications. Stories which you like can be easily shared with others. 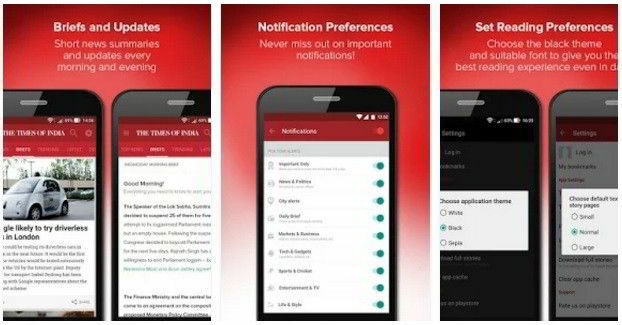 InShorts adds a new widget to your phone. Place this widget on your phone’s home screen to get the latest headlines. InShorts has a beautiful interface. Once news has been synced to your mobile device, you can read it offline. Google news is one of the most trusted sources for news. It covers stories from around 75K major publications from all over the world. GN displays stories published on trustworthy websites. Hence, you won’t find fake news in this application. Google News has a special carousel feature that allows a user to go through their favorite or any other interesting news by swiping to the left or right direction on the screen. Pages powered by Google AMP will open within a few milliseconds on your phone. 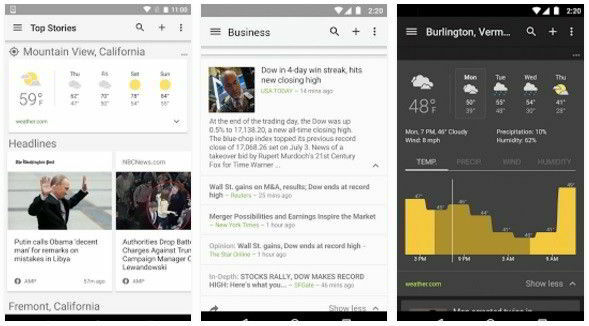 Google News app is easy to use. It makes users aware of the local weather. It supports two themes, dark and light. GN service is baked into the latest Android OS. To access it, swipe left on the home screen. Google News allows you to follow topics of your interest. It includes a toggle option to hide the weather information. Unlike the above applications, BBC is not a news aggregation service. It is one of the largest and most respected broadcasting companies in the world. It has been operating since 1920. 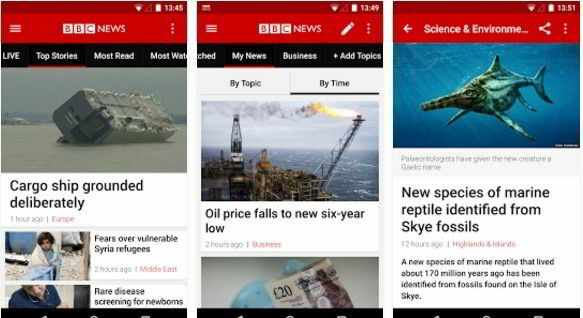 BBC’s news app is popular in English speaking nations. The content you’ll discover in this app is published by top quality journalists. BBC News will ask first time users to select their favorite topics so that it can recommend news stories of your interest. It has a news recommendation engine which suggests stories related to the one you’ve recently read. TOI news app has been published by the Times group, the company behind the popular local newspaper, the Times of India. The app has several unique features because of which I have added it to our list of the best news app. TOI has the option to read the news in brief. It has a live TV feature where you’ll find video coverage of a breaking story. 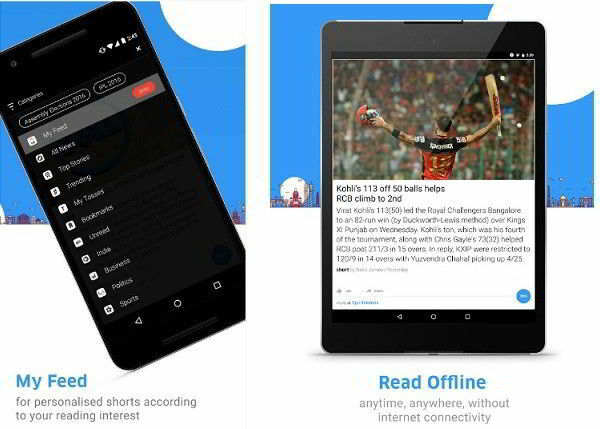 TOI supports bookmarking of articles and offline reading. You can control what notifications you would like to see. The official Times of India app supports night reading mode. It supports downloading of images, sharing news story and many more features. Fox news is one of the most watched TV channels in the world. 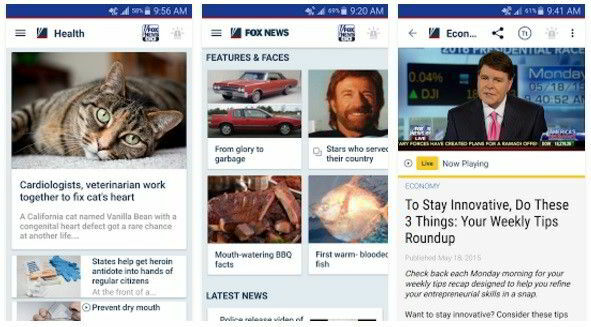 In case you want to get news from Fox TV, then download and run the Fox News application. FN supports live streaming of news videos. It lets you watch video news and read the latest stories at the same time. The video player can be resized by the user by switching the phone to landscape or portrait mode. If you are a fan of a Fox new journalist or a TV show, you can follow and get updates from them through the app. Conclusion: BBC, InShorts, Flipboard, Fox, and TOI are the best news apps for Android and IOS operating system. They are top rated applications and have 1+ million users. Try them out!